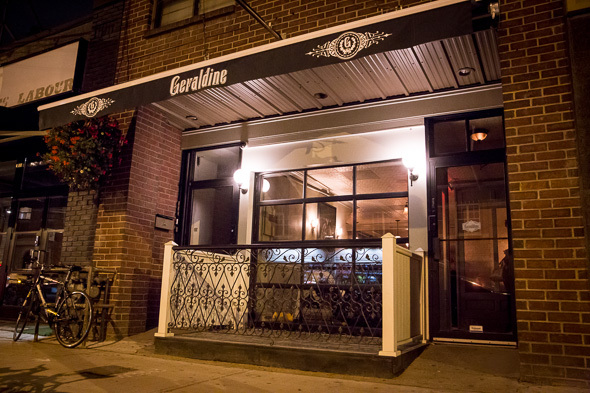 Geraldine is now open in Parkdale courtesy of locals Peter Ramsay (formerly Chef de cuisine at Sidecar ) and partners, Alexandra and Randy Albert. 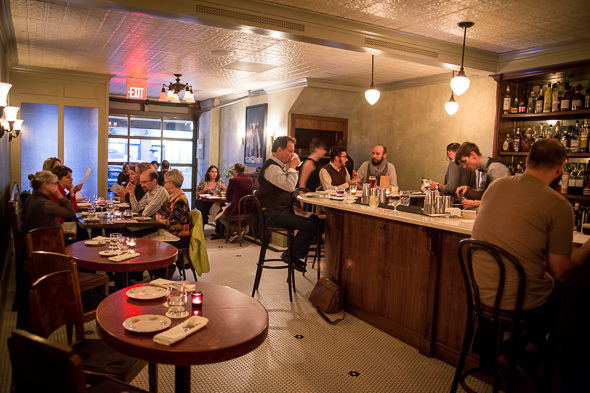 The space has been entirely made over since its former days as Mark Cutrara's Cowbell . 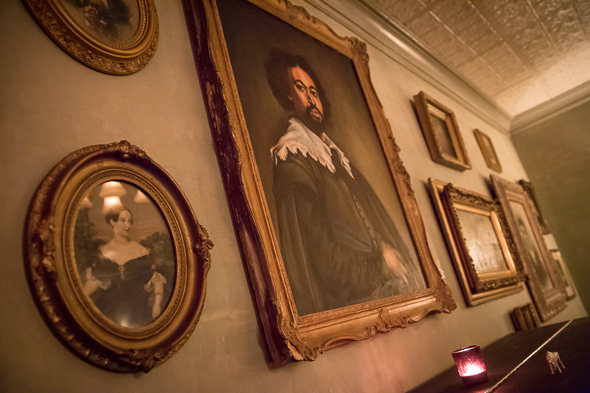 The decor is inspired by the pre-prohibition cocktail lounges of the past. Dim wall sconces and framed artworks adorn the slate-coloured walls, and eclectic tableware and crystal stemware were scavenged from local vintage dealers and yard sales. The piano in the back is on loan from local musician Graham Howes, who pops in a couple times a week for impromptu sets of jazz standards. The menu poses a major dilemma for me as it reads like a wish-list of all my favourite things and it's not easy to choose amongst options like Beef Tartare ($9), Oysters Rockefeller ($6) or a soft boiled egg with caviar ($6). Better still, the price tags are all quite reasonable - though you should plan to order multiple things if you plan to assemble a full meal from the snack-size small plates. There's a daily selection of seafood available a la carte or en masse. 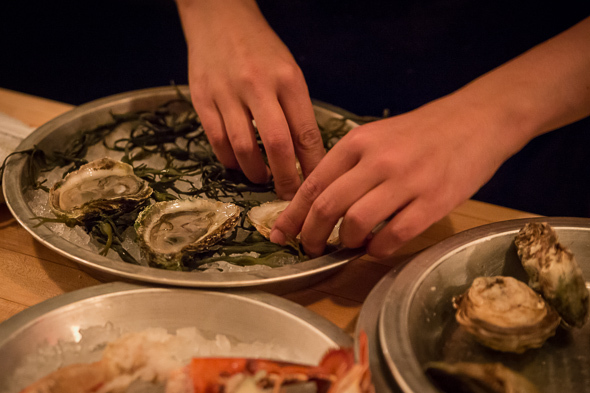 Tonight, platters featuring six oysters, four clams and a half lobster go for $30. Three-tiered towers go for $75. 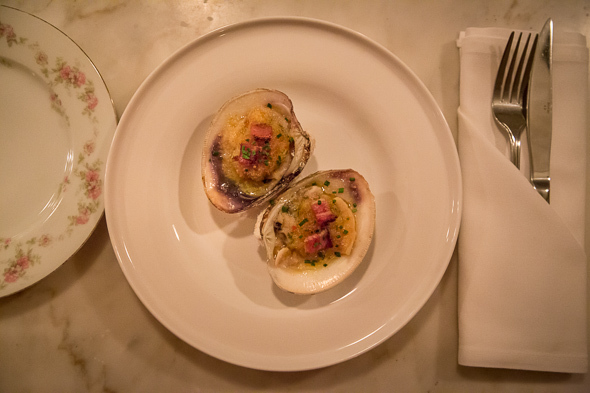 If the raw bar isn't of interest, there are hot plates like the Clams Casino ($6), served two per order and oozing with butter and bacon. 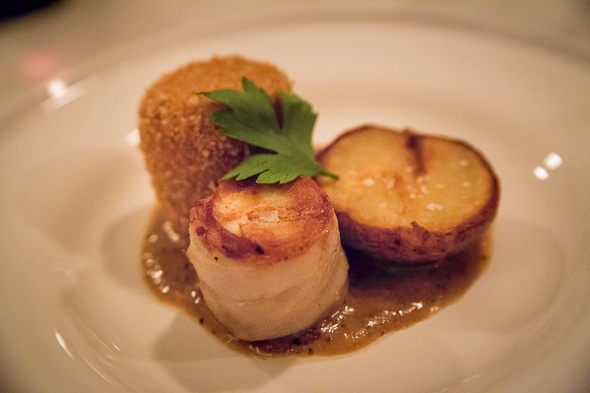 The Rabbit two ways ($11) is done with loin meat wrapped in bacon and accompanied by a crispy, golden croquette filled with leg meat confit and butter, all atop a dijon sauce with a fried potato on the side. Leave your vegetarian friends at home because meatless options are limited on tonight's menu to cheese and 'stuff' (which includes Kitten and Bear preserves made just down the street), fries with curry mayo, and, a seasonal salad. Taking advantage of the ingredients in their prime is a common theme and results in an ever changing menu. 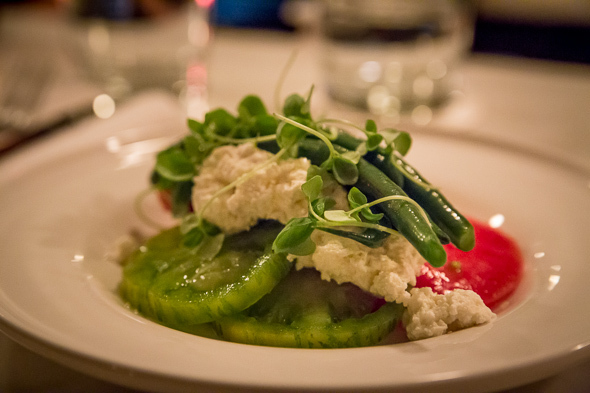 Today's salad ($7) boasts slices of plump heirloom tomatoes, green beans and warm housemade ricotta. Under the list of libations, Absinthe is front and centre. Classic cocktails from Michael Mooney (formerly of Banu ) include standards like a Sazerac ($12) or Charlemagne ($11), each prefaced on the menu with a brief historic description. On tap, Ontario craft beers come care of Kensington Brewery and Beau's, plus, Thomas Lavers' ginger beer. The wine list starts at about $35 a bottle. Geraldine is open Wednesday through to Monday until midnight, on the weekends hours extend until 2am. 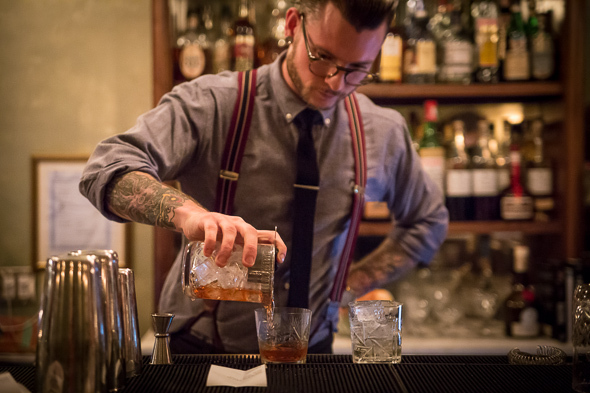 The kitchen is always open until last call. Eventually, the offerings will extend to include a daytime tea service, just don't expect brunch; Ramsay came up through the ranks working brunch shifts and is not a fan.